Located on Motu Piti Aau ("Two hearts" in Tahitian) near the Le Meridien, the InterContinental Resort and Thalasso-Spa Bora Bora is one of the top Five Star Hotel on Bora Bora. The resort called for revolutionary solutions in both environmental protection and comfort. The sea water air-conditioning system is unique in French Polynesia and eliminates pollutants effects. This deep sea water is also used in the Thalasso-Spa, the first one to be built in the southern hemisphere. This desalinated, extraordinarily pure deep sea water, containing an excellent complement of nutritional of mineral salts will be bottled under the label "Vai Moana" right at the Spa. The architects and interior designers, in cooperation with the InterContinental Hotels Group have combined Polynesian tradition and contemporary style, making this resort hotel unique beyond compare. * 21 “Emerald” Over water villas with a view over the beach and the resort. 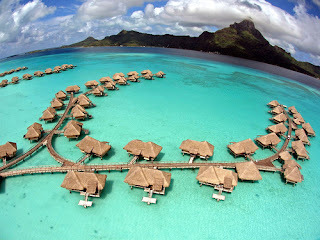 * 24 “Sapphire” Over water villas with a partial view over the lagoon and the island of Bora Bora. 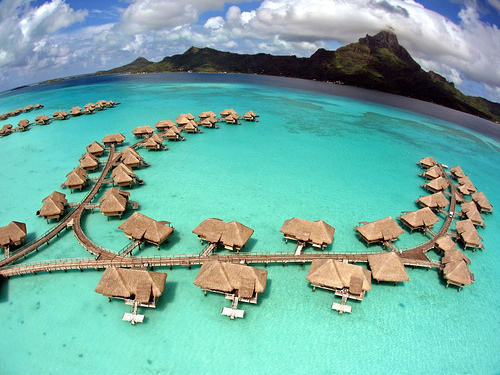 * 35 “Diamond” Over water villas with an unobstructed view to mount Otemanu and the lagoon. The villas have roofs of pandanus thatch as did the traditional Polynesian homes called fare. All overwater bungalows have direct access into the lagoon from their split-level decks equipped of a dining table and lounge chairs. A « must » is breakfast delivery by flower decorated outrigger canoe (to order the day before and weather permitting) straight to the terraces of the overwater villas. Located along the beach, the infinity pool blends seamlessly with the lagoon beyond. Relaxing is easy on the surrounding deck, which features chaises longues, umbrellas, and a shaded swim-up pool bar. Bubbles Bar: This trendy bar overlooks the beach, the lagoon and spectacular Mount Otemanu. Comfortable and cozy it is the ideal spot to meet and relax anytime of the day. Guests can enjoy many types of drinks, exotic cocktails and light snacks. Open from 10:00 am to 11:00 pm. Le Reef: This beautifully designed and relaxing Polynesian tropical decor restaurant, opens onto the patio and out to the lagoon, with a gracious landscaped terrace, stepping down to the beach. Open for breakfast and dinner from 07:00 am to 09:30 pm. Sands: Ideally located on the resort’s private 1000 feet of white sand beach, it is the perfect rendez-vous for casual dining as well as exotic and delicious fresh fruit cocktails. Open from 11:00 am to 09:30 pm. Choose from an extensive menu, day or night, ideal for time-zone-hopping travellers, impromptu meetings or for quiet, private dining. The Unique Deep Ocean Spa by Algotherm - from the Greek “thalassa” (sea) and “therapeia” (therapy), thalassotherapy is a range of care based on the benefits of seawater and marine elements. Encompassing nearly an acre, the Thalasso Spa is the first of its kind in the entire southern hemisphere. Redefining the spa concept in French Polynesia, the Thalasso Spa is a true destination spa – offering healing spa therapies by treatment, by day, and by full customized weekly regimen. A full Thalassotheraphy and Balneotheraphy center designed by the famed Dr. Tregger who designed Monaco’s thermal baths, and managed by the Algotherm company whose reputation and expertise extends the world over --- the Spa uses mineral-rich deep seawater in innovative signature treatments and a variety of hydro-therapies, including medicinal therapies. The Thalasso Spa will feature a huge Aquatonic seawater pool, Hammam a l’oriental, a fitness and aerobic room, and glass bottom overwater massage suites. Guests will have the opportunity to be guided towards personal fitness or health goals by the spa’s team of therapists and specialists with personalized programs and nutritional menus tailored to their individual needs. “Seaweed Body Wrap and Scrub on Floating Bed” 75 minutes, from $240 per person. “Pearl Rain Massage” 25 minutes, from $140 per person. “Honeymoon 3-Day Discovery” includes three deep aromatherapy baths, two marine body scrubs, two 25-minute custom body massages, two scalp reflexology, two ‘Iaorana’ massages, two marine indulgence body wraps. Treatments performed over a 3-day period, from $1750 per couple. As part of the Thalasso Spa, the center features a state-of-the-art gymnasium with advanced cardiovascular an weight machines. No matter what time of day, professional and knowledgeable local staff is available for all guests who may require assistance with hotel amenities, or information or bookings for excursions or local attractions.